I made this electronic version of a Bach piece back in 1995 using my Amiga computer and a Yamaha keyboard. (I was more clever back then -- whatever happened to me? Ha-ha!) I connected my keyboard to my computer using a MIDI cable. I played all the voices one at a time on my Yamaha keyboard (sometimes slower, just to get the notes into my sequencing software, where I could bring them up to proper tempo easily). When I was done, the software used the MIDI connection to play back all the voices together on the Yamaha keyboard. It was fun creating all the different sounds I used in the piece -- they were often made up of combinations of 2 or more sounds built-in to the keyboard to make interesting new voices. One of the sounds was "harpsichord" + "banjo", as I recall. I remember the chimes sounded much richer if I also sounded the note an octave lower, slightly offset to the beat. I had 28-note polyphony on the keyboard, which means a maximum of 28 sounds can be playing at one time. It sounds like a lot, but believe me, you run out of simultaneous notes fast! I know I was pushing the maximum number of voices at several points during the piece. 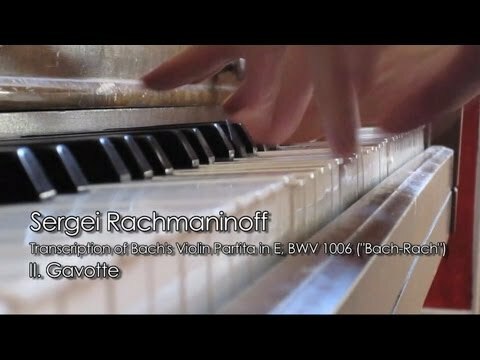 I used the Rachmaninoff piano transcription of this piece as my source, so that's what I am displaying in this video. I know it's kind of a cliché to do an electronic version of Bach, but I hope you like it anyway!